Sunday, April 16, 1911: Easter Sunday, no chocolate eggs were in evidence. I went to Sunday school this morning. Went over to Stout’s this afternoon. Miss Carrie wasn’t at home though, having gone away to spend Easter. It sounds like Grandma’s family didn’t celebrate Easter in 1911—though other families in the area apparently participated in extended family gatherings since Grandma’s friend Carries had gone away to spend Easter. Grandma’s maternal grandparents lived in Turbotville, and her mother, Phoebe Derr Muffly, had 7 siblings—many of whom lived within 15 miles of the Muffly farm. It is somewhat surprising that the extended family didn’t gather to celebrate Easter. I had lots of fun experimenting with dying eggs using onion skins two days ago—now I have lots of hard-boiled eggs that need to be used. Goldenrod Eggs are an old-fashioned traditional Easter food. Remove shells from eggs; chop whites finely; add to White Sauce. Press yolks through a sieve and add seasonings. Pour White Sauce over toast arranged on a platter, and garnish with yolks of eggs. 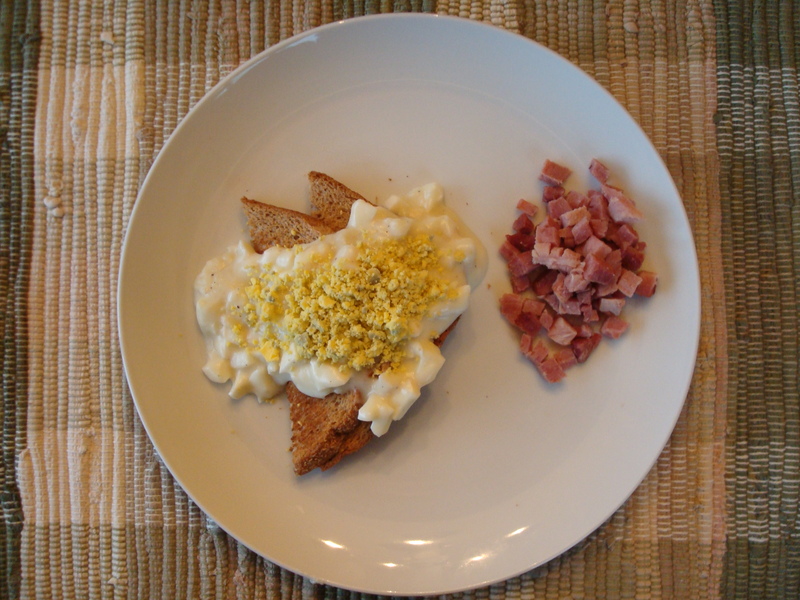 This dish may be very attractively arranged by placing spoonfuls of finely chopped ham around the toast. Melt butter, add flour, seasonings and liquid. Stir until the boiling point is reached. Boil two minutes, beating constantly. Posted on April 16, 2011 September 10, 2015 by SherylPosted in Food, Holidays, recipesTagged eggs. Next Next post: No Weeds in the Yard, and Dandelion for Dinner! A very good and tasty dish!